Scalloped pineapple stuffing is a sweet counterpart of the typical savory variety enjoyed with holiday meals. 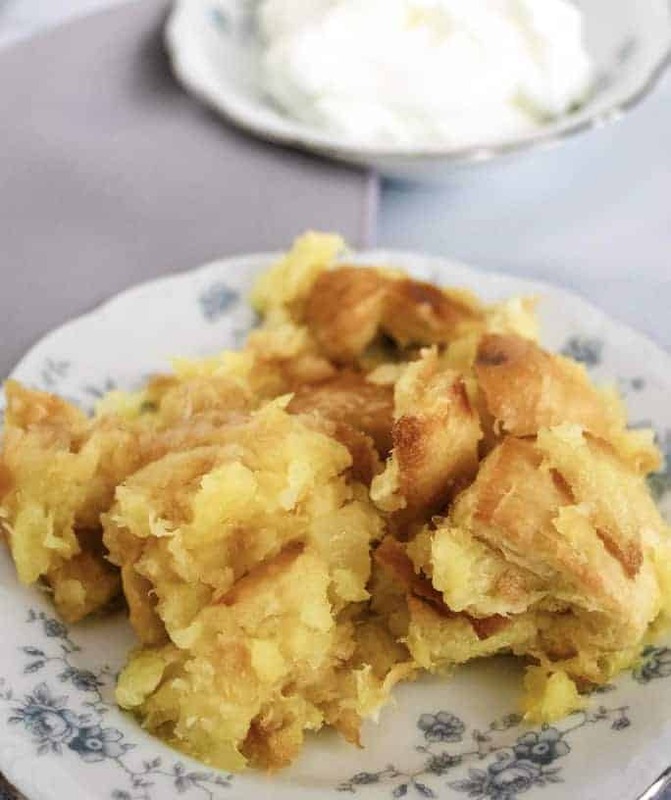 It is delicious served as a side item with ham or turkey, or you can top it with a dollop of whipped cream for a delectable dessert. You can make this sweet scalloped pineapple stuffing in the Instant Pot or in the oven! Either way, it’s an easy yet tasty addition to your table! Growing up, dressing was always one of my favorite side dishes for our big holiday dinners. Actually, I always called it “stuffing,” even though we didn’t typically cook it in the turkey. What is it about flavorful bits of bread cooked in a savory liquid that makes it so divine? Later in life, I discovered the sweet counterpart to the savory classic I love so much. 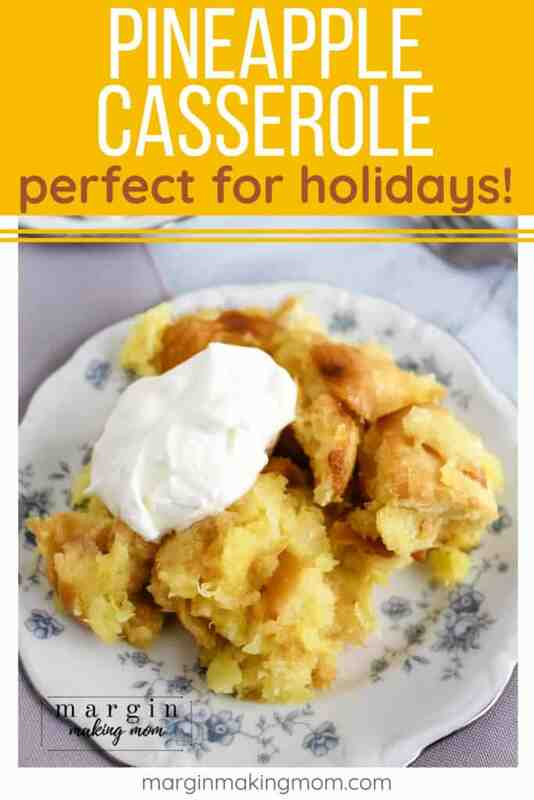 My mother-in-law introduced me to this delectable dish, which has quickly become one of my favorite items on a holiday menu. 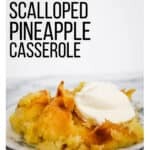 Pineapple casserole, scalloped pineapple, pineapple dressing, or pineapple stuffing. It may go by several names, but no matter what you call it, one thing is for sure. It is seriously good. It’s also ridiculously easy to make, and one of those dishes that proves that sometimes, simplicity wins. 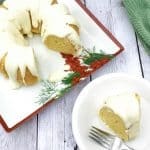 We traditionally bake this in the oven, but I recently decided to try it in my Instant Pot. 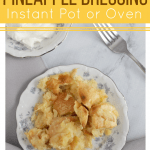 I figured if I could make caramel pumpkin bread pudding or eggnog pecan french toast in the Instant Pot, why not make pineapple dressing in the Instant Pot, too? You start with some cubed bread, preferably day-old. Toast it in the oven until it starts to turn golden brown. Then, the bread gets tossed with some melted butter. Add the bread to a mixture of pineapple, sugar, eggs, and pineapple juice, stirring well to allow the bread to absorb the liquid. At this point, it’s up to you if you want to bake it in the oven or cook it in the Instant Pot. The dressing will be just a little bit more “wet” if you opt for the Instant Pot (because it’s a moist cooking environment instead of a dry environment, so there’s little evaporation of liquid), but the delicious taste is the same. However, you could always decrease the liquid (you could drain more of the pineapple juice out) a tad if you prefer. 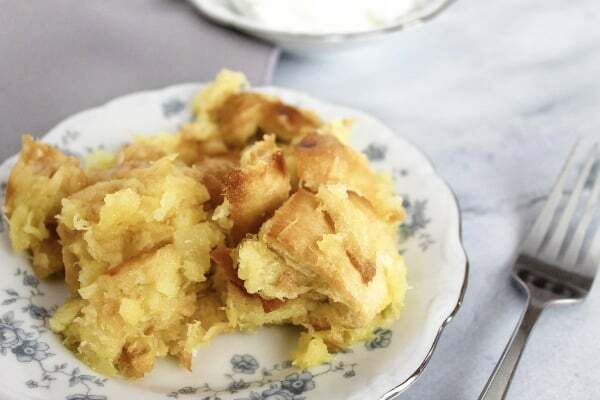 You can follow the traditional method of preparation for scalloped pineapple casserole by baking the dish in the oven. Simply combine toasted bread cubes with some melted butter. Add pineapple, sugar, eggs, and pineapple juice, stirring well to allow the bread to absorb the liquid. Pour the bread mixture into a greased baking dish and bake at 350F for 1 hour, or until the bread is nice and golden brown on top. This is a perfect side item to accompany ham or turkey. 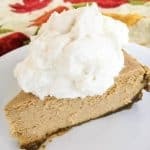 You can also top it with a dollop of whipped cream and call it dessert! It will turn out lovely, but it does take a little bit longer this way. If your oven is being used for other items, such as a ham, you can make this scalloped pineapple stuffing in your Instant Pot! Grease a baking dish that fits in your Instant Pot. Combine toasted bread cubes with melted butter. Stir in pineapple, sugar, eggs, and pineapple juice, stirring well to allow the bread to absorb the liquid. 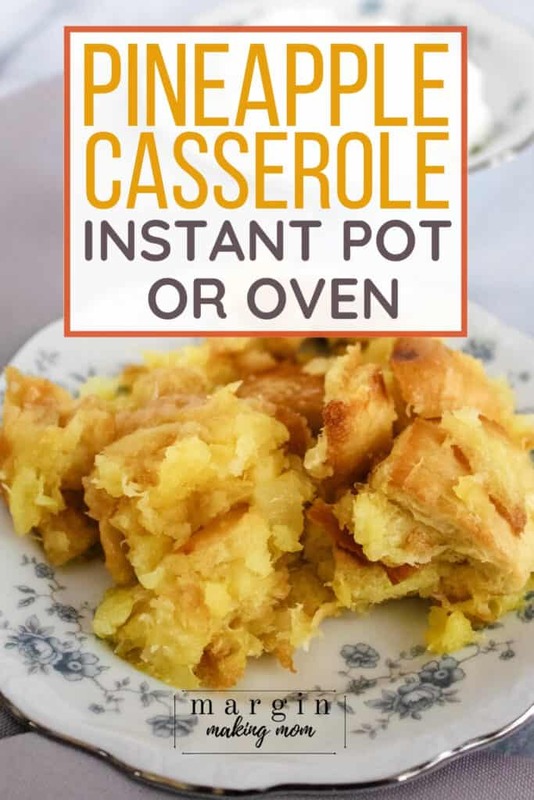 Place dish in Instant Pot. Add the bread mixture to the prepared baking dish and cover with foil. Pour 1.5 cups of water into the insert pot of the Instant Pot, then place the trivet into the pot. Use a foil sling to lower the baking dish into the insert pot, placing it on the trivet. Cook at high pressure for 20 minutes, followed by a natural pressure release. Crisp the top, if desired. I prefer the top to be crisped up a bit, so I remove the foil from the top of the dish and transfer it to a preheated oven for 5-10 minutes or so, allowing the top to become golden brown. This step is optional. Either prep method will give you a tasty side dish that could also double as a dessert. I like to top it with a dollop of whipped cream! 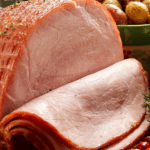 It makes a lovely accompaniment to ham, turkey, or chicken–perfect for Easter or Christmas! 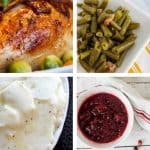 See my entire list of Easter Instant Pot recipes and simplify your holiday meal prep! Scalloped pineapple stuffing is a sweet counterpart of the typical savory variety enjoyed with holiday meals. 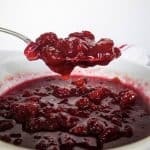 It is delicious served as a side item with ham or turkey, or you can top it with a dollop of whipped cream for a delectable dessert. Make it in the oven or Instant Pot! Preheat oven to 350F. Place cubed bread on a baking sheet lined with foil or parchment paper. Place baking sheet in oven and toast bread until turning golden-brown, about 5-10 minutes. While bread is toasting, combine sugar and eggs in a large mixing bowl, stirring until well-combined. Drain 1/4 cup of the heavy syrup from the can of pineapple and discard (you can drain more juice if you want the dressing to be less moist). Add remaining pineapple and syrup to the egg and sugar mixture, stirring well to combine. When bread has toasted, remove from oven and drizzle butter over the bread, tossing to combine. Add bread to the mixture of sugar, eggs, and pineapple. Gently stir to combine, allowing the bread to absorb liquid. Proceed with method of choice below. Place trivet in the insert pot of the Instant Pot. Pour 1.5 cups of water into the insert pot. 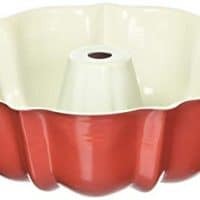 Grease a baking dish that will fit into the Instant Pot. Add bread mixture to the baking dish. Cover dish with foil and use a foil sling to lower dish into the Instant Pot. Close lid and set the vent to the sealed position. Select a 20 minute cook time at high pressure using the Manual or Pressure Cook button. When cook time is complete, you can perform a quick release or natural release of pressure. When pressure has released and valve has dropped, carefully open the lid and use the foil sling to lift out the baking dish. Remove foil cover from pan. Transfer to preheated oven (350F) to crisp up the top for about 5-10 minutes, if desired. 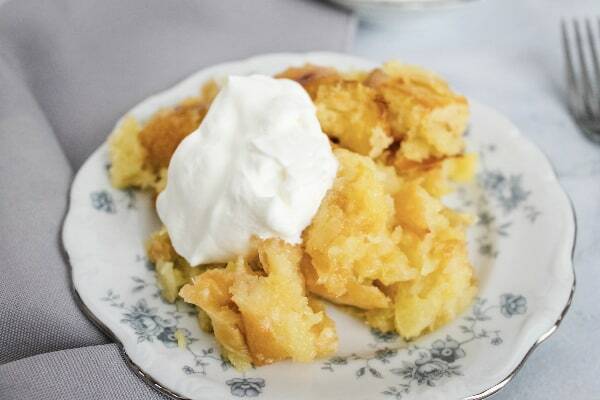 Serve warm as a side dish or top with whipped cream for dessert. Pour bread mixture into a greased baking dish. Transfer to a preheated oven (350F) for about 1 hour, or until top is golden brown. If using a cheesecake pan in the Instant Pot, line the outside of the pan with foil to prevent seepage of liquid. 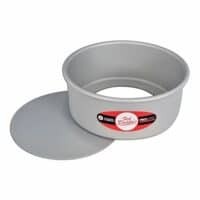 You could also use a bundt pan or other baking dish that fits into the Instant Pot. 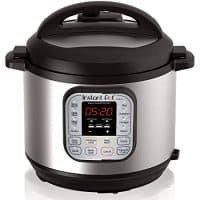 Preparing in the Instant Pot will yield results with slightly more moisture, since the Instant Pot is a moist cooking environment with very little evaporation (instead of a dry environment as in the oven). If you prefer the texture of the stuffing to be a bit drier, you could decrease the pineapple juice used or use the oven method of preparation. I love seeing my recipes "in the wild!" Snap a photo of your creation and tag me on Instagram @marginmakingmom or use #marginmakingmom so I can see it! Want to learn more about pressure cooking? Scroll down and sign up below to receive my free guide to getting started with your pressure cooker! Thanks you! Let me know how you like it if you decide to make it! 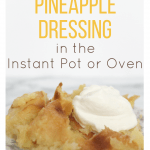 I am loving this pineapple dressing recipe. I made it this New Year’s Eve Party celebration. My kids love it and they won’t stop eating. Thanks for this. Merry Christmas and Happy New Year! Xoxo. Hi Jennifer! Thanks so much for your kind words–I’m so happy to hear that it was a hit with your family! It doesn’t last long around here, either. 🙂 Merry Christmas and Happy New Year to you, too! We shared this pineapple dressing with whipped cream this holiday season. Everyone in the family loves it! Every bite burst with happiness, it’s like the heaven opened its gates. This is so good, so thumbs up!